I found this location via a Google search. I remember the first time I looked in Colorado Springs; there were only a small handful of rooms. When I was there the last time, there were well over a dozen rooms in Springs. This one happened to have just opened a few weeks prior. A notorious thief named Iris Trenton has struck again and the case files have been given to you. She’s been outsmarting the authorities for quite some time now, leaving puzzles and taunts at all of the crime scenes. Note that the story actually further unfolds as you progress through the room. This room didn’t look like much if I’m being honest. When we got in the room, I counted less than 10 things in the room, but everything was used. There were several things I haven’t seen before in a room, and without giving anything away I can tell you that you need a keen eye in this room or you’ll absolutely miss something important. There was one puzzle we were working on that threw me for a loop, but at some point I had an epiphany and figured it out. (After talking with Don after we escaped, he said that was the quickest he’s seen it solved so I had that going for me.) There were one or two things that we overlooked, so like I said, keen eye. There were a lot of locks from what I recall but it kind of worked. Remember, you’re in an old house, in the attic. Just needs to be dustier. The puzzles, though, were well done for the lack of items there in (which is a total complement). One thing of note. On the website, the picture for this room has an old attic and that’s what I assumed we’d be walking into. When we spoke to Don after the room, that was originally the plan but they had to get a different location at the last minute and weren’t able to build it out as such. Anyway… I do love ‘hidden in plain sight’ things but one of them definitely got us. Here’s a hint for you: Search everything. Twice. (Refer to Rule #3). One puzzle, if you recall above, I said I had an epiphany on how to solve it. That’s how…let’s go with treacherous, that’s how treacherous some of the puzzles are. Nothing is blatantly set to confuse or to be impossible to solve, but some do require a bit of brain power. Giving the puzzle difficulty its own rating, as I have been doing for a bit now, I’d say 3-7.5. That’s a damn decent spread and not terribly difficult. But don’t bother guessing at things; if you find yourself trying to brute force a lock, you haven’t found the clue yet. The story for this room unfolds further as you progress. You get to see where Iris has been and what she’s stolen from who (and for whom). This is one of the few rooms I’ve escaped where that level of story/detail is present. Usually it’s just here’s your background story and here are your puzzles. This one pushes the narrative along as you play. Otherwise, using my terrible powers of imagination, you can kind of picture the room being used as a home base. There’s a map, suit cases, tables and chairs. The attic…design would really make it, though. They used a monitor with written clues on the screen so no voice issues. Still not a huge fan of the whole monitor-provided-clues, but it is what it is. I don’t think there’s really a *best* way to provide clues anyway. Yeah, the one clue we got was helpful. Believe there were a few nudges too. Final Thought: I was pleasantly surprised by this room. Considering it was open for only 2 weeks, and this was their first location, it was quite good. 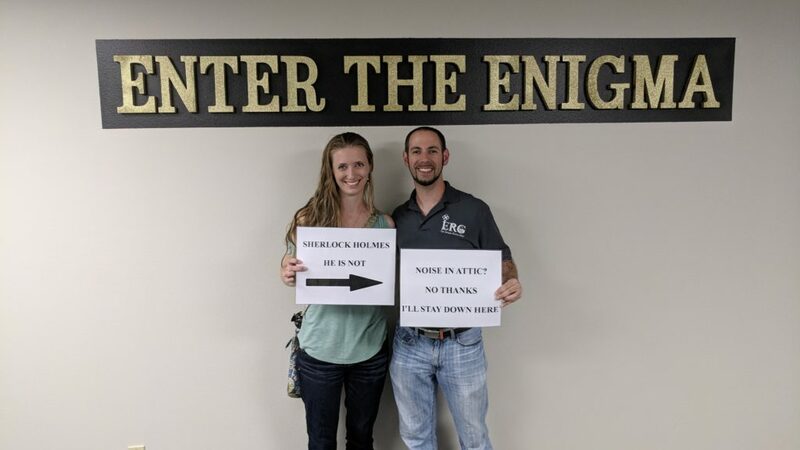 (Not to mention we got on the leader board in our first escape room together.) Enter the Enigma should definitely stay on your radar (it’ll be on mine for when I return). With a little more in the set design category, I expect big things here.